Armed with an iPhone, a Moleskine notebook and my trusty MacBook, I board a bus with 60 other journalists from nearly every tech publication that matters. We’re joined by investors, industry analysts and the kinds of people who ‘know a guy.’ Shoved into a bus that screams luxury but smells more like a truck stop bathroom, we’re not off to a good start. We’re late. 15 minutes quickly turns to 30. And then 45. It’s hard not to admire the irony. 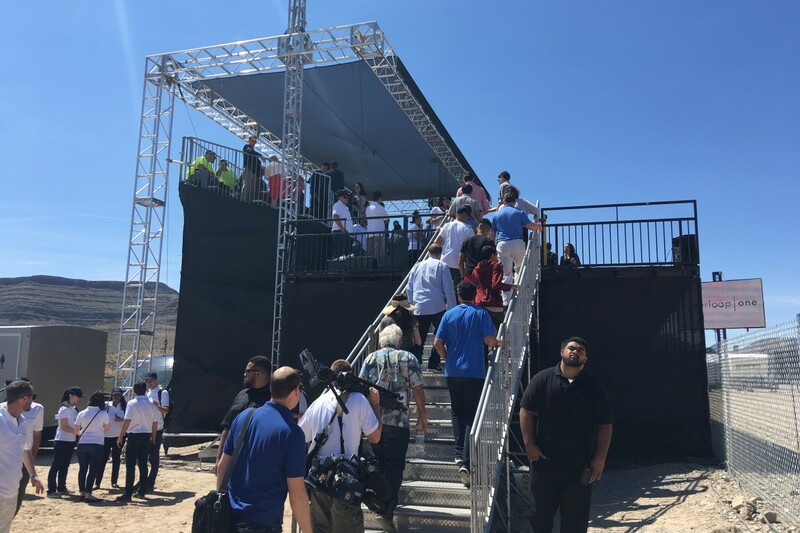 We’re here to witness early-stage testing of next-gen public transport said to travel at 700-plus miles per hour, an air-lifted pod capable of bridging the gap between San Francisco to Los Angeles in about 30 minutes. We’ve been waiting 45 minutes to leave the parking garage before embarking on a 30 minute trip 18 miles into the desert. Hyperloop One Co-Founder Shervin Pishevar knows this pain. He’s recognized it, compartmentalized it, and aimed to do something about making it go away for good. It’s not his first gamble in tech. The legendary Silicon Valley investor is probably best known as an early stage investor in Uber, a company many of his peers thought was unfounded hype. Many think the same about Hyperloop One. “All big things have small beginnings. We’re completely humbled by the story of how this company began,” Pishevar said at a press event the day prior. There were no bold plans for Hyperloop. Musk told Pishevar that he was probably going to open source the concept, a move that could (and did) lead other companies to developing his vision. In addition to wrangling six children at home, Musk was the acting CEO for both Tesla and Solar City and had his sights set on new horizons beyond our atmosphere in SpaceX. 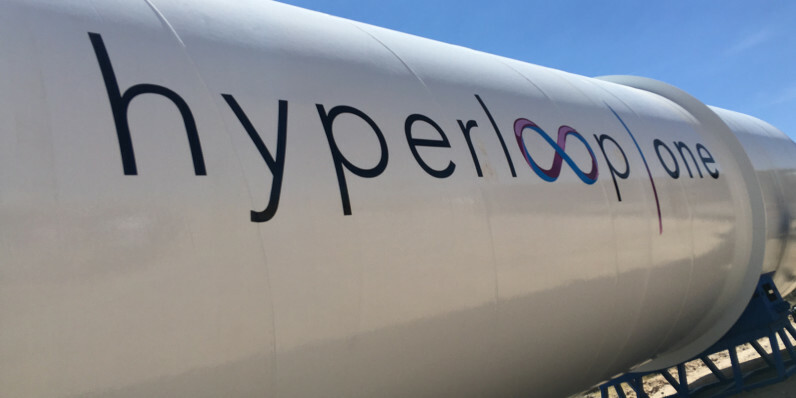 After some back and forth Pishevar got Musk’s blessing to start a company using his Hyperloop roadmap. That was three years ago. What was once a concept is now a team, a team with top talent, infectious enthusiasm and an eye on the future. 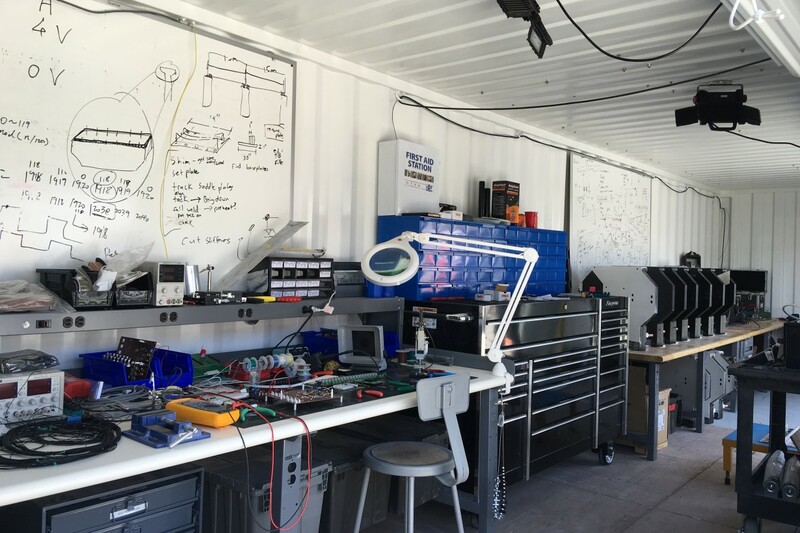 Led by some of the who’s-who in the tech world — Rob Lloyd (Cisco), Brogan BamBrogan (Space X), Josh Giegel (Virgin Galactic) and others — Pishevar grew a company from an open source concept, to two testing facilities (Los Angeles and Las Vegas) and 150 engineers, designers and builders. “Everyone we’ve hired on our engineering team has come from a background of building things [not just analyzing them],” BamBrogan said. In a day where unicorns are sometimes built in months, it’s important to remember that apps and SaaS businesses don’t often require regulatory approval, teams of engineers or extended testing to ensure their customers aren’t rocketed off a track at 700 miles per hour. Progress would be slower going than the tech climate had become accustomed to, but progress was indeed happening. And today we got to witness it with our own eyes. It’d be hard to ignore the hurdles Hyperloop One still faces, or the ambitious timeline, but Pishevar and BamBrogan are quick to point out the system is already viable. We’re not waiting on dramatic achievements in science to move the project forward. Instead, the team’s major hurdles come in the way of a sluggish regulatory environment, a battle over land rights, and proving to the public (and investors) that Hyperloop is not only safe, but a better alternative than existing forms of transportation. “It’s real; it’s happening now,” said Pishevar. 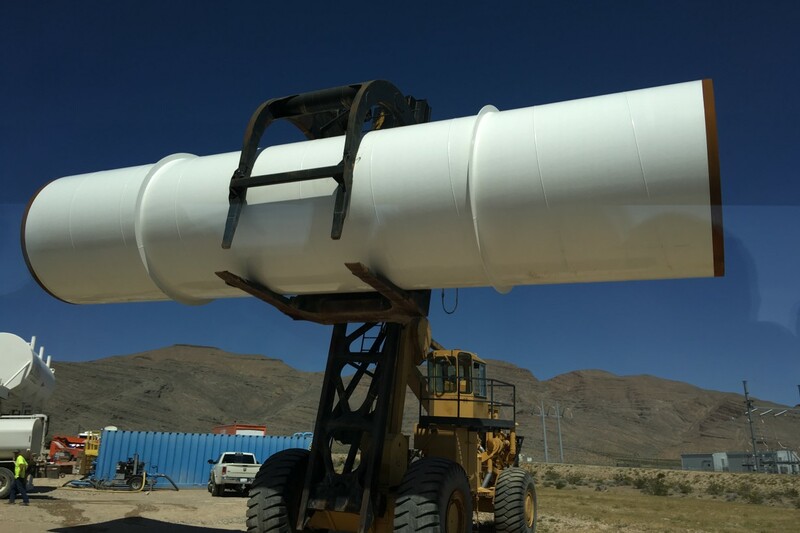 Although recently cleared to begin testing by the Nevada Bureau of Land Management, the slow pace of the powers that be and the upcoming struggle to secure land could lead Hyperloop One to greener pastures overseas. Los Angeles to San Francisco was once considered its $6-plus billion proving ground, but these days it’s looking increasingly likely that the first trip via Hyperloop pod will happen in Europe. 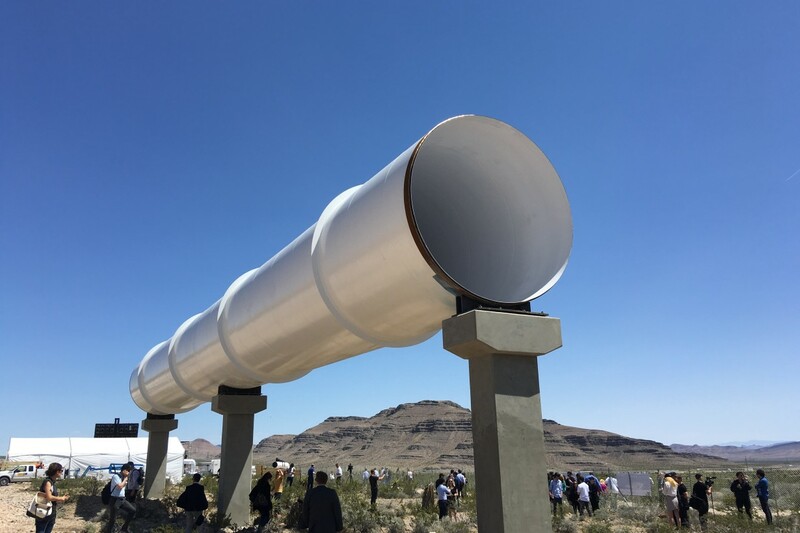 Hyperloop One also has competition to in the lesser-known but equally ambitious Hyperloop Transport Technologies (HTT), a company that announced major news of its own this week about a licensing deal to use magnetic technology from Lawrence Livermore National Laboratory. Where we are now standing is a dusty tract of land generously known as North Las Vegas, a baron wasteland 30 minutes outside the Vegas Strip. Here, you’re just as likely to see vultures feeding on roadkill as you are another human being. In a word, it’s desolate. Seated with members of the press, investors and tech industry insiders, there’s a buzz in the crowd that’s palpable. You can feel the enthusiasm, an energy made apparent by the raucous applause from a gallery that hangs on every word as the company’s top executives make pointed comparisons to Kitty Hawk and the transcontinental railroad. It’s hard to find fault with the approach. For my generation, this is our moon landing. It’s our Kitty Hawk, our transcontinental railroad. Hell, it’s our steam engine. If successful, Hyperloop One changes the landscape of transportation and nudges its way into the conversation about the greatest achievements in the history of mankind. We’ve been told the finished product will levitate inches above tracks while rocketing passengers through tubes at breakneck speeds. Today’s test is a steel sled, on wheels, rolling down a train track. Maybe I’m underselling it. The sled is set to travel over 100 miles per hour in all of two seconds while pulling 2.4 G’s, about half what it takes to stop blood flow to your brain long enough to pass out. There’s also enough electricity flowing through the rig to kill a man, or so we’re told. Pishevar takes the stage, as does CTO Brogan BamBrogan and CEO Rob Lloyd. Each waxes poetic about creating infrastructure to support this revolutionary transportation system. The system, BamBrogan says, could be carrying cargo by 2018 and humans by 2021 — if legislators continue to cooperate. “An operational Hyperloop system is fully controllable. 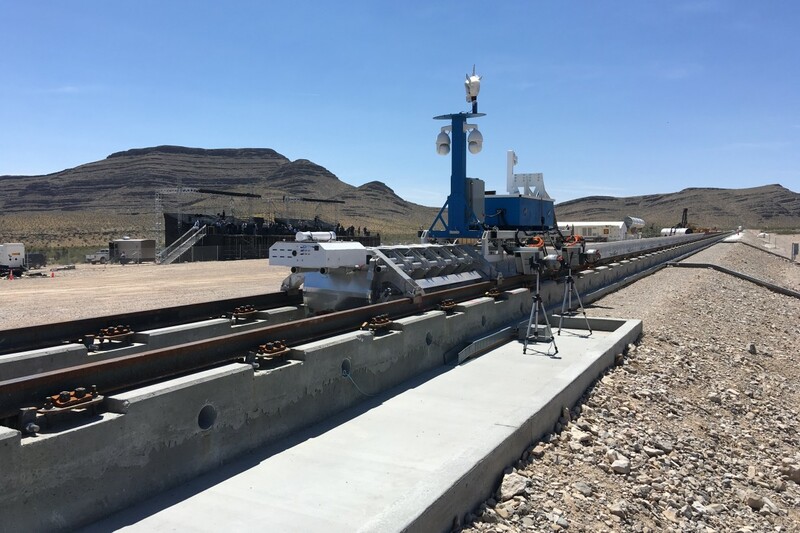 The point of this test isn’t just to move this sled, it’s to engineer a custom propulsion system that is scalable to a production commercializable Hyperloop. That’s really the goal is we’re really bringing cost of this down by custom engineering and making sure that what we engineer now is scalable for both passengers and freight,” BamBrogan says. The test goes off without a hitch as the sled tops 100 mph and comes to an abrupt stop in sand at the end of the track. The crowd goes nuts, the company’s executives hug and high-five, and we’re all left with the feeling we’ve witnessed something truly extraordinary. It’s explaining this feeling to those who weren’t in attendance that proves most difficult. How do you make a sled motoring down a quarter mile of train track sound exciting? It’s hard to explain, but the lively conversations and sense of amazement felt by those in attendance pales in comparison to watching video of a hunk of metal being shot into a sandbox. The experience was more than the sum of its parts, at least to those who got to witness it firsthand. In hindsight, maybe it wasn’t the test. Maybe what we’d witnessed was just a piece of a larger puzzle that — if only for a moment — made everyone in attendance marvel at what humans are capable of. 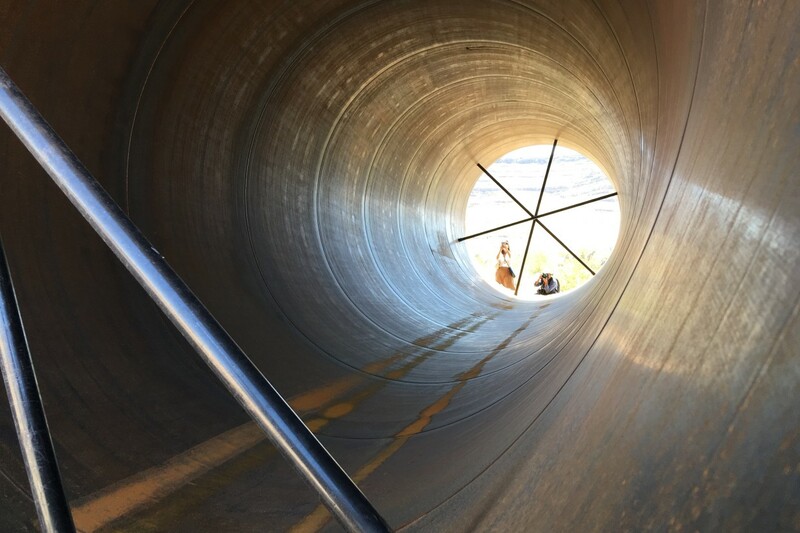 In that moment achievement was all that mattered and on a Wednesday in the Nevada desert, Hyperloop One took a giant first step toward achieving greatness not witnessed in many of our lifetimes. But there’s a long road ahead before we’re riding that train.